Please come out and enjoy this family-friendly event at Voss Automotive Group at 3115 Fremont Street, Las Vegas, NV 89104. 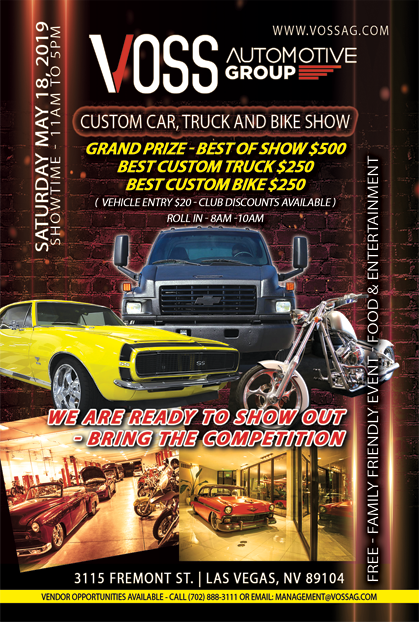 The show will feature cars, trucks, hot rods, motorcycles and many one-of-a-kind vehicles. This Event is FREE for the public and all ages are welcome. Best of Show, Best Truck, and Best Bike. There will be over 15 Classes of Competition for vehicles and awards for all of the judged categories. Car and Truck Clubs are welcome. Contact us today to reserve a discounted space for your Group.